Sadly, an official astronomical tribute to David Bowie is not in the stars. Many fans of David Bowie (myself included) have always considered the singer, songwriter and actor more than just a mere mortal, so it seemed fitting when we heard there’d be a tribute to the original space oddity in the very stars from whence he came. Sadly, though, it seems there won’t be any ch-ch-changes to the night sky after all. An astronomical tribute to Bowie was announced by the MIRA Public Observatory in Belgium following the musician’s death last week at the age of 69. 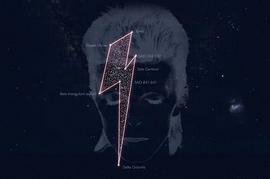 The observatory, along with radio station Studio Brussels, delighted grieving fans with the Stardust for Bowie project, a plan to name for Bowie a seven-star constellation in the shape of his famous lightning bolt motif. But the International Astronomical Union, which is in charge of officially naming constellations, says it hasn’t received any application that a constellation be named after the late singer — and more importantly, that the constellations are already mapped and named. MIRA has since updated information about its tribute, saying that it was all supposed to be a symbolic gesture to honor Bowie rather than an official astronomical update. However, all is not lost: fans could always petition to have an asterism after Bowie. Asterisms are patterns of stars that group stars together even if they’re not part of the same constellation, like “The Big Dipper”, which is formed of the brightest stars in the constellation Ursa Major. The suggested lightning bolt pattern of stars could fall into this category. The iconic red and blue lightning bolt was painted on one side of Bowie’s face on the cover of his 1973 album “Aladdin Sane”, which featured hits such as “The Jean Genie”. By adopting the alter ego of alien rock star Ziggy Stardust, singing otherworldly songs like “Starman” and playing an alien in the 1976 sci-fi film “The Man Who Fell to Earth,” Bowie spoke to those of us who also felt like aliens on Earth because we didn’t quite fit in — whether it was because of our sexuality, appearance or quirky personality. By creating the kind of bizarre persona of a non-human who just wanted to belong, he made us all feel like we should embrace our unusualness and be proud of our differences. “Space Oddity” holds such a dear place for astronomers and astronauts alike that in May 2013, Canadian astronaut and commander of Expedition 35 Chris Hadfield performed the song while in orbit, floating inside the International Space Station. The resulting footage was the first music video ever shot in space, and quickly went viral. Here’s hoping we still see some sort of an official astronomy-based tribute — whether it’s an asterism, a satellite or even a new planet name — to honor everyone’s favorite Starman.